On the Fourteenth Day of December . . .
Two years ago today, twenty-six people, twenty of them children, were killed by a lone gunman at Sandy Hook Elementary School. It was a tragedy that captivated a nation, as we all tried to come to grips with how was it possible that this unassuming elementary school in Newtown, Connecticut had become the latest backdrop for school violence. Even two years later, there are more questions than answers, as there really is no way to make sense of something so horrifically senseless. In the days after the tragedy, though, there was a collective national effort to make sure that those who died did not die in vain and that something good come out of something so very bad. Nothing could bring back the twenty-six people who were killed, but something could make sure that love triumphed over evil. And so began the practice of performing random acts of kindness and other charitable acts to honor those who no longer were here. Previous Post: On the Thirteenth Day of December . . . I remeber that day vividly! Watching the news in disbelief that such a crime could happen. It is the very reason that I let my kids have a snowball fight with flour on Christmas eve. Who cared if I had a mess to clean up I had my kids and that was what mattered. When tragedy strikes, it definitely puts things into perspective, and I am so glad that you shared this sweet memory of your own children getting to have fun. May we all be kind to each other and remember what really matters, as life can change on a dime. Living in CT it really hit home. It’s a frightening thing when you feel that your kids are unsafe in their schools. Just today I somehow got a Sandy Hoax blog in my Reader. I don’t know how it happened, but I blocked all blogs from that person. How crazy do you have to be? The only thing to do is be grateful for what we’ve got. On that day, I remember I couldn’t wait to see my two little girls after school, and I didn’t want to let them out of my sight. I kept thinking about the parents of those children and how their day began normally and ended tragically. It definitely made me so very grateful for all of those little moments that I once took for granted. This is one of those posts that brings me out of my own world, and settles me down to what is very real, and costly, and … redemptive. I heard the report on the radio, just as I was pulling into a Starbucks on that day. I was meeting a good friend. I asked him if he had heard about the shootings, and he had not heard. I do not visit your blog as much as I would like … What a powerful blog, a beautiful blog, one that reminds me of what is important. Thank you so very much for taking the time to read this and to share your story and kind words. It was day that will never be forgotten indeed, and I can only hope that we all do our part to shine brightly to keep the darkness at bay. Thanks for posting this today. It’s so easy to let time slip by and eventually to allow something this serious and tragic to fade into memory. Reading over what is written about each victim of this awful crime was very touching. Families have set up foundations and programs to honor each child and teacher in a very personal way. I hope donations pour in to all these worthy causes. Most of all, I hope we never forget these young children and their heroic teachers. You’ve done us a great service by keeping this alive in our memories and hearts and by encouraging people to learn to act on kindness. So much work needs to be done. Thank you so very much, as it was an honor to write this tonight. 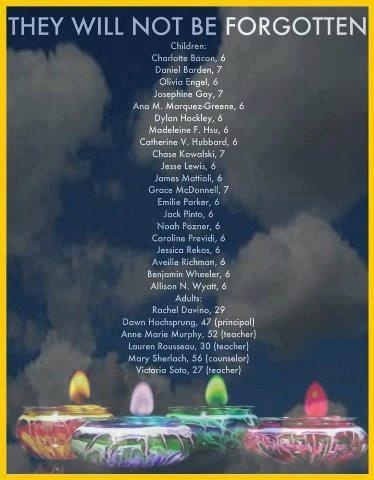 We cannot forget these precious lives, and we all must do our part to be lights when confronted with darkness. That is one of the nicest compliments that you could give me, and I thank you! My heart goes out to all those in Australia, and I agree that enough is enough. My hope is that, in the end, love will win! I was one a plane bound for Europe when the news feed had the tragic story and it was then twenty-four hours before I could find out the details. It was truly a sad day. Your reminder of the kindness that still exists in the world is uplifting. Thank you, Elizabeth, and I hope that some day, tragedies like this one and the one in Pakistan today end and that peace prevails. Our children deserve better! I remember that day so well and I remember the tears I cried as I read about it all. Tragically two years later the world changed for people in a cafe in Sydney (15th December) also. My heart goes out to those in Sydney and in Pakistan, and I long for the day when there is peace all over the world.